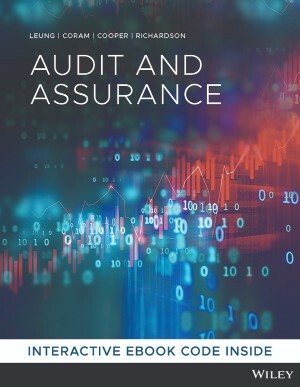 Written for the local market, the first edition of Audit and Assurance (Leung et al.) features a concise and contemporary presentation of auditing. 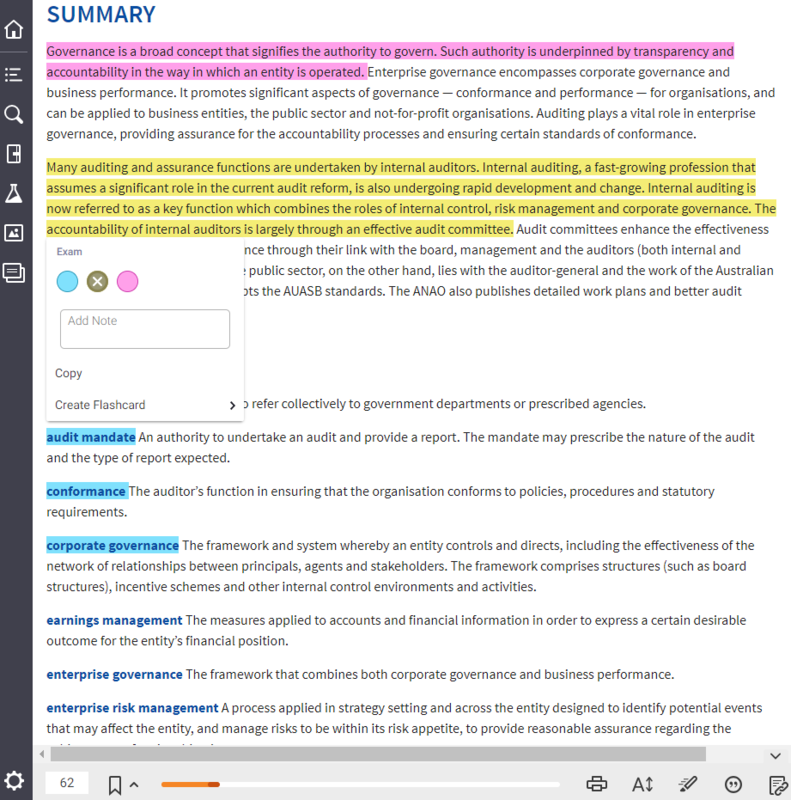 The text is delivered in a cutting-edge interactive digital format designed to motivate students by taking the road blocks out of self-study. The text is accompanied by Ernst & Young’s acclaimed audit case study, Cloud 9. 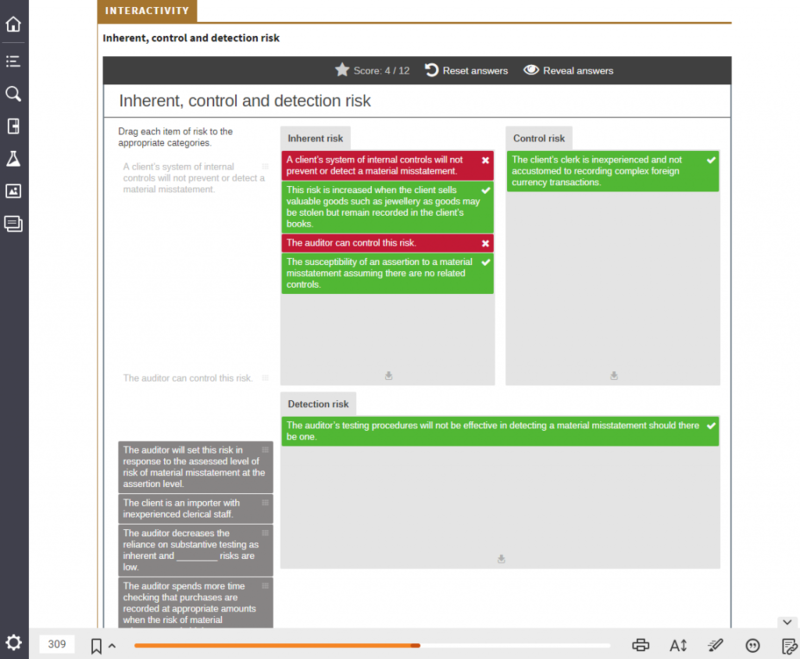 The aim of this case study is to expose students to the practice of auditing and the tasks they would typically perform in their first year of auditing practice. 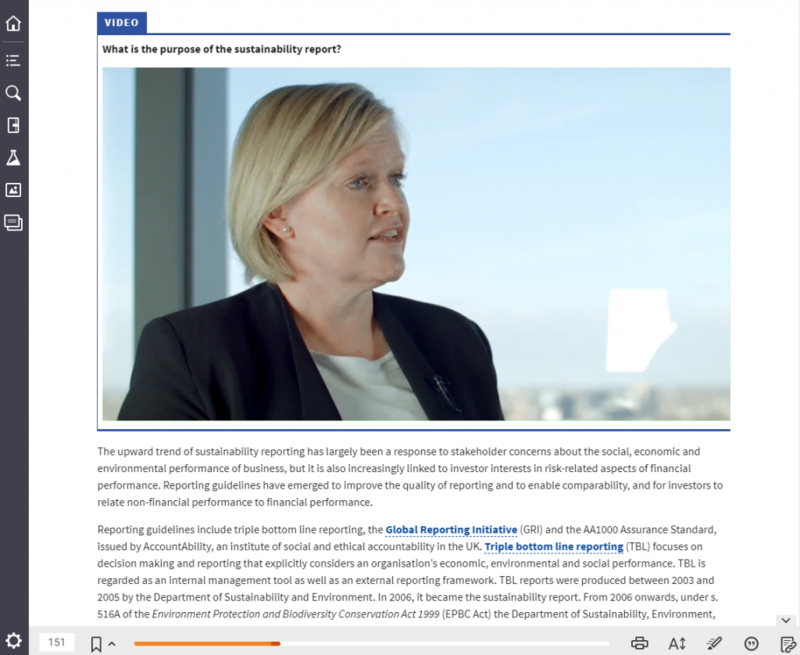 The interactive eBook is a new breed of self-study resources, which includes video insights from practitioners that explain the key audit processes and practice, and immediate feedback at the point of learning. 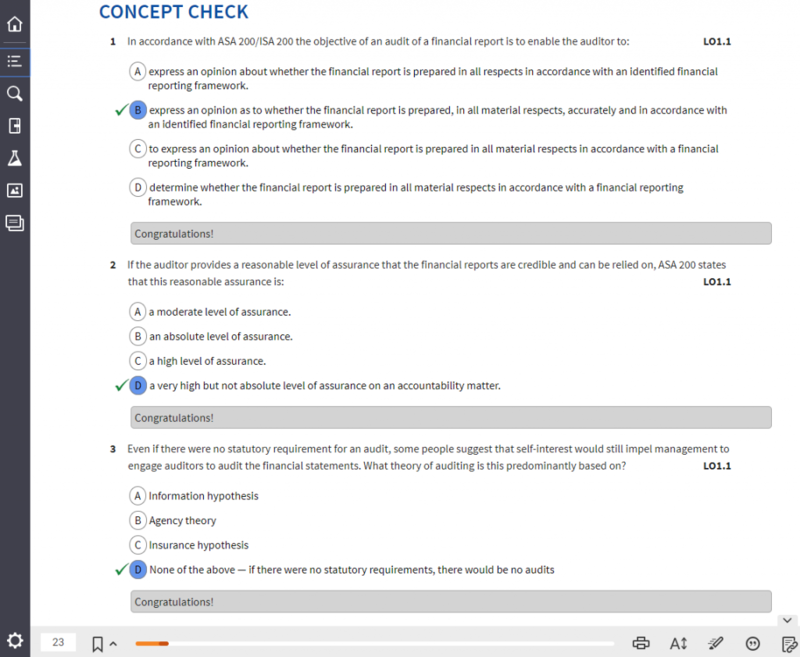 The Cloud 9 audit case study is a companion product that challenges students to apply their audit skills and knowledge to a business case. Audit and Assurance, 1st Edition contains the core materials in a typical auditing unit. The text does not include redundant content like many other texts in the market. Philomena Leung is Professor of Accounting and Associate Dean International Engagement at Macquarie University, Sydney. She has extensive teaching experience at tertiary and postgraduate levels for over 40 years, specialising in auditing, ethics and corporate governance. Prior to undertaking the role at Macquarie University, Philomena held senior academic positions at Hong Kong Polytechnic University and in Australia at Victoria University, RMIT University and Deakin University. Her PhD in accounting ethics and her KPMG auditing experience from Hong Kong provide an insight into issues relevant to the accounting and auditing profession. Philomena is passionate about the future development of accounting, and has initiated and implemented a number of innovative and integrative projects including in the area of cyber security, design thinking and business challenges. Paul Coram is Professor of Accounting at the University of Adelaide. Paul has a Masters in Accounting from the University of Western Australia and a PhD from the Australian National University. He worked as an auditor and became a Chartered Accountant with one of the Big Four firms in Australia, also gaining work experience as an auditor in London. He is actively involved with the Institute of Chartered Accountants and has been a member for over 20 years. Paul has postgraduate qualifications in education and was the inaugural winner of the Pearson Education Accounting Lecturer of the Year Award in 2001. Paul complements his teaching with research in auditing, and has a particular interest in the areas of audit quality and the value of assurance services. Barry J. Cooper is Professor of Accounting and Associate Dean — Regional Engagement at Deakin University, Melbourne. He has a Bachelor of Commerce and a Master of Education from Melbourne University, a PhD from RMIT University, is a Fellow of CPA Australia and the Association of Chartered Certified Accountants (ACCA), and is a past global president of ACCA. After gaining experience as an auditor, Barry joined RMIT University in 1972 where he taught auditing and financial accounting. During his academic career, Barry has undertaken a number of research projects in the areas of auditing, ethics, corporate governance and accounting education, presented at numerous conferences, published a number of articles in professional and academic journals, and co-authored several books. Peter D. Richardson is the Chief Financial Officer of an Australian housing association based in Victoria. He has a PhD in Accounting and is a member of the Institute of Chartered Accountants in England and Wales. After spending 10 years working for various private accounting firms in the United Kingdom and a further 8 years teaching professional accounting in the private sector, he moved to Australia where he joined Deakin University as a Lecturer in Accounting and Auditing. Since 2010 he has combined working for a number of social housing organisations in the not-for-profit sector with teaching financial reporting and auditing to students preparing for the exams of the ICAA and CPA Australia. Students can purchase their Audit and Assurance, 1st Edition (Leung et al.) textbook from Wiley Direct.